How attractive is the exterior of your home? Curb appeal is all about first impressions and Vinyl Fence Depot can help create a welcoming feeling to your home for your family and guests. Vinyl Fence Depot offers high quality vinyl fence options for the Santa Clarita Valley and San Fernando Valley. Adding a vinyl fence enhances your home aesthetically and securely. Not all vinyl fences are created equal and low grade vinyl is notoriously vulnerable to degradation from weather, exposure to high UV light, and extreme temperatures which can make the vinyl brittle and prone to crack prematurely. Vinyl Depot only carries the highest grade vinyl fencing materials, which are thicker than the competition’s to last a lifetime. Vinyl Fence Depot has been manufacturing, fabricating, and installing quality fencing products for over 20 years. As a family-owned company, they take pride in delivering a quality product with amazing customer service. 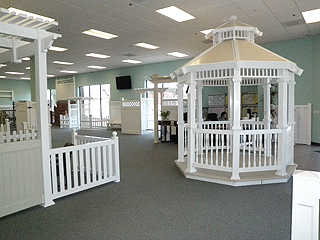 Vinyl Fence Depot specializes in vinyl fencing, railing, decking, patio covers, gazebos, gates, and arbors. Vinyl Fence Depot understands that no two properties are symmetrical so they individually customize, fabricate, and install each vinyl project for each client. Their entire staff are trained professionally in design, layout, and building codes to ensure that your project will be done right the first time while improving the value of your home. Visit their Van Nuys factory and showroom or their new Santa Clarita showroom to view samples or call to arrange a free consultation at your property. Choosing the right product to accomplish your needs and improve your property value is an art. Their service professionals will not only get you there but will also make it fun to discover the possibilities. At Vinyl Fence Depot, they offer great fencing alternatives that last a lifetime.